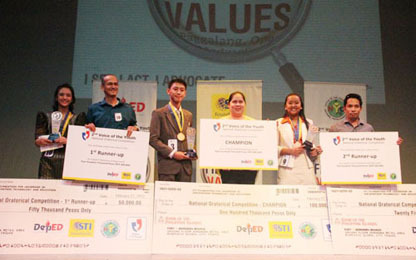 From more than 600 high school participants nationwide down to 12 young orators during the finals, Karl Ckristian A. Cruz of Saint Mary’s College of Tagum in Tagum City, Davao del Norte, emerged as the National Champion of the 2nd Voice of the Youth — National Oratorical Competition (VOTY) on February 27, 2012 at the Carlos P. Romulo Auditorium, RCBC Plaza, Makati City. 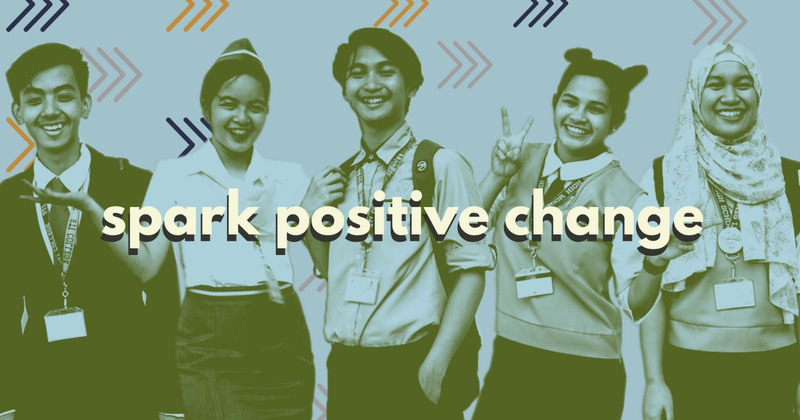 Spearheaded by the Department of Education (DepEd), National Youth Commission (NYC), and STI Foundation together with the STI network of schools, the VOTY is an advocacy that aims to develop critical thinking and English communication skills among the youth today. 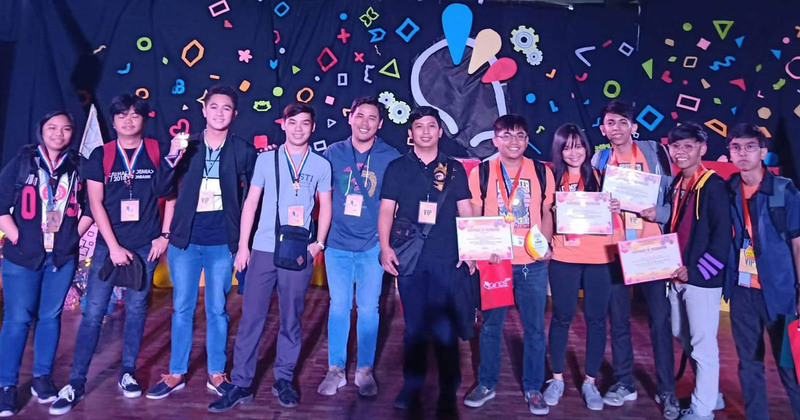 The 12 finalists, already winners in their own right after winning the divisional and cluster levels of the competition, delivered their prepared speeches themed "Rediscovering Filipino Values: I See. I Act. I Advocate." to a distinct panel of judges composed of Mr. Leon Flores III, Chairman and Executive Officer of NYC; Mr. Teodoro Locsin, Jr., broadcast journalist; Dr. Francisco Benitez, President, Philippine Women’s University (PWU); Dr. Patricio Lazaro, a former Speech and Drama professor, University of the Philippines-Diliman (UP); and Ms. Yasmin Nuguid, Literature Coordinator, St. Scholastica’s College, High School Department. 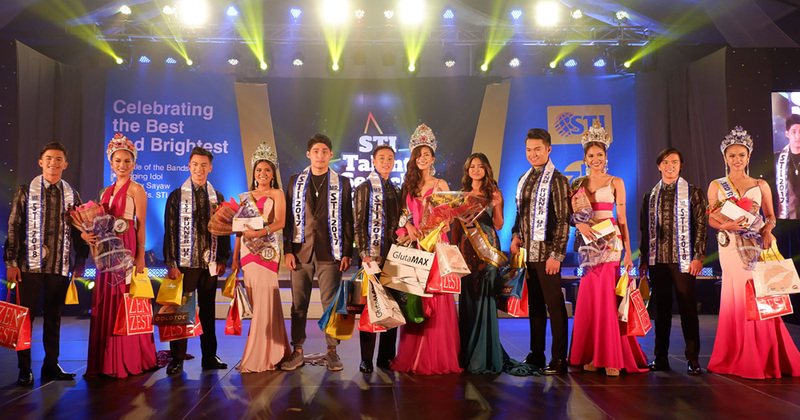 More than 1.5 million pesos worth of prizes were given away. In his winning piece, Karl Ckristian stressed that values are ideas and beliefs that determine a person’s being, which never change. 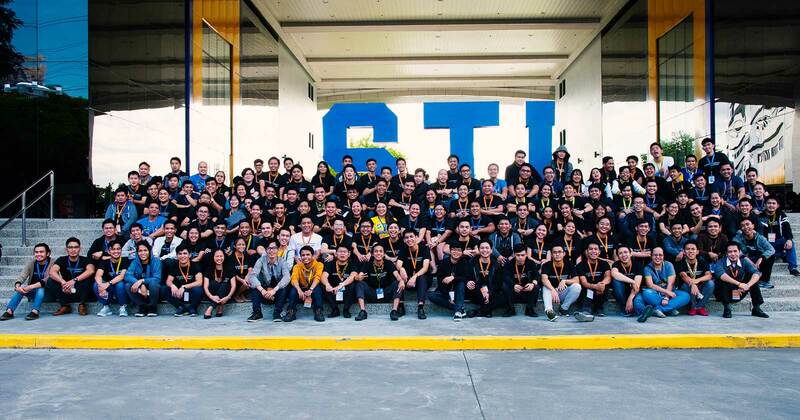 By eloquently expressing his conviction, he impressed the audience and the panel of judges, and won the competition, taking home PhP100,000 in cash. 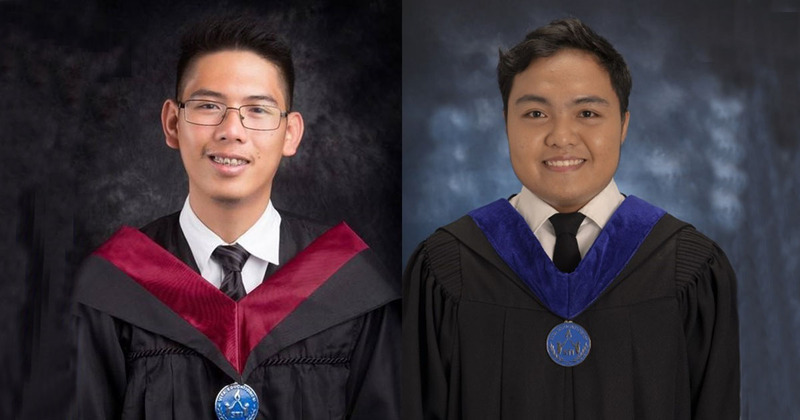 His school also won PhP800,000 worth of computer laboratory package while his coach, Ms. Joan Lanciola, received a CANON EOS 1100 DSLR camera. 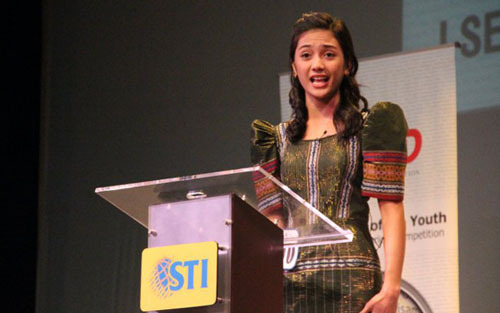 1st runner-up Patricia Rianna C. Angeles was very persuasive on convincing Filipinos to be proud of their heritage. 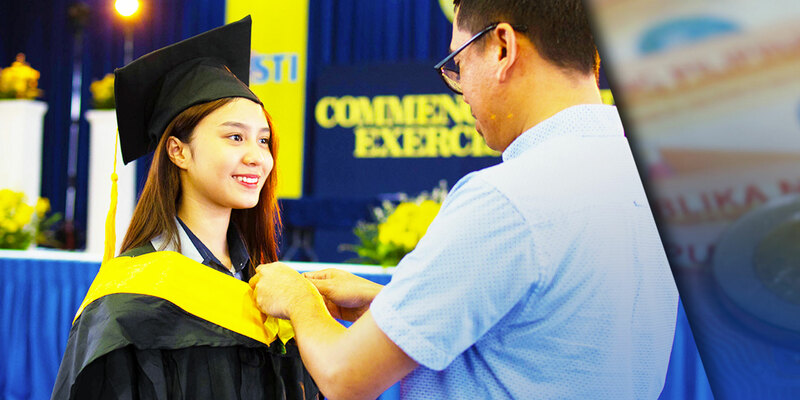 She explained that the Filipinos are unique thus Filipino values must be imbibed, practiced, and passed on to the next generation. 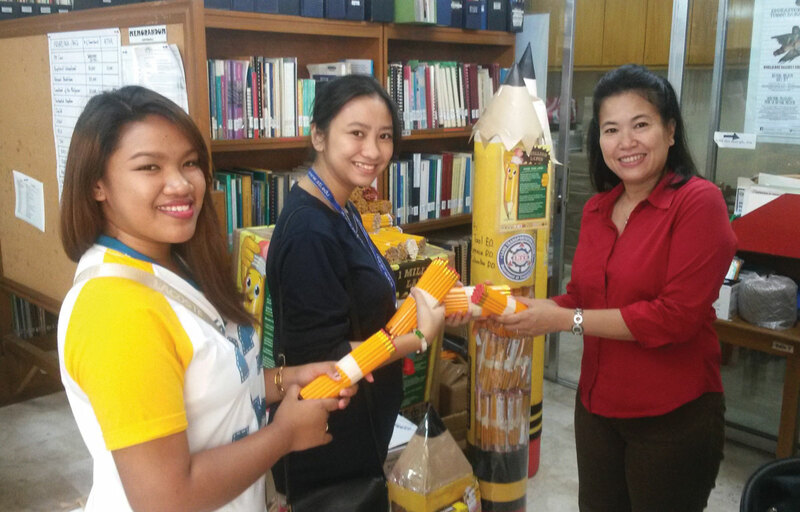 Patricia Rianna went home with cash worth PhP50,000 and her school, Integrated Montessori Center in Taguig City, Metro Manila got PhP400,000 worth of speech laboratory package. Her coach, Mr. Orlando Pascual also took home an ACER Aspire One Netbook. 2nd runner-up, Zarina Joyce S. Mojica talked about the importance of the values of bayanihan and damayan as awe-inspiring spirits of communal unity, and our love for one another as a family and as a nation. 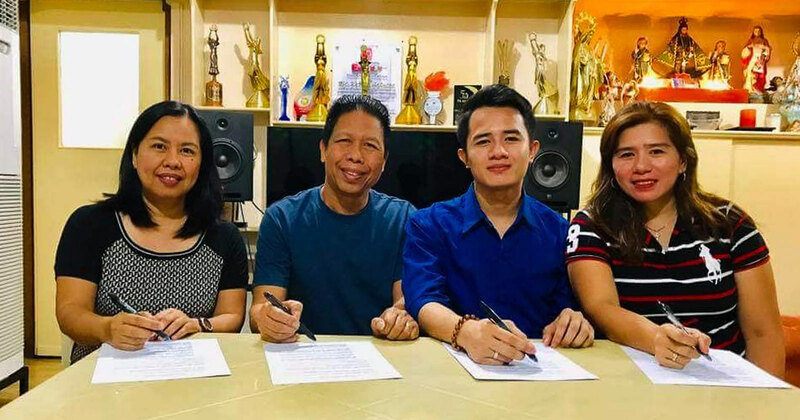 She received PhP25,000 for herself and PhP200,000 worth of audio-visual equipment package for her school, Col. Lauro D. Dizon Memorial National High School in San Pablo City, Laguna and her coach, Mr. Dennis Lacsam received an AOC 24-inch LED TV. 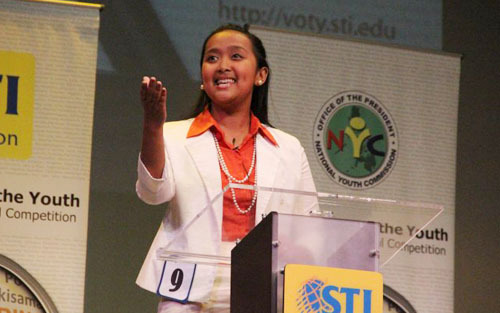 "I would like to extend my warmest congratulations and deepest appreciation to those who made the 2nd Voice of the Youth National Oratorical Competition a remarkable success! The judges have commended the superior talents of the participants as well as the well ran competition. Even now, we are looking forward to next year's VOTY." 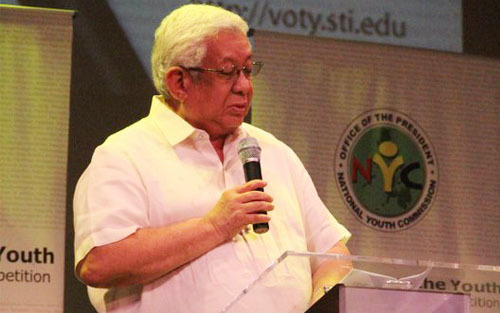 shares Monico V. Jacob, STI Foundation President. 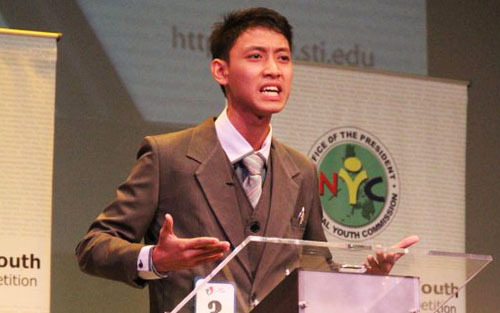 Apart from the jam-packed 400-seater RCBC auditorium, the 2nd Voice of the Youth National Oratorical Competition was also witnessed live nationwide through web streaming at http://eradioportal.com/stistream.asx.